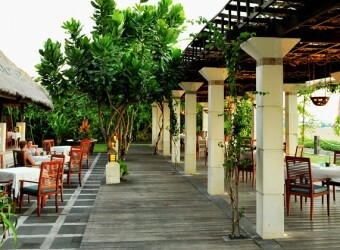 Bali Ma Joly French Restaurant is a beach front restaurant directly behind Kuta Beach, located in Kupu Kupu Barong Beach Resort. You can enjoy lunch and beautiful sea view at noon and watching beautiful sunset over spectacular coastline, and you can also enjoy romantic candlelight dinner at night. The restaurant offers a wide range of menu and drinks including wine. I went to this long established restaurant which is located in the hotel resortl. At daytime I had some beer while listening to the sound of the sea waves here, and here is French dining in the evening. I think it’s good to come here if you stay in Kuta or Legian.